Gosh, it's been way too long since my last post. Life has just gotten away from me the past month. Hopefully things will slow down and I can start doing some regular posts. Here are lots of random pictures from Halloween. Little E is growing up; we went trick or treating with his friends from the neighborhood...he had a blast! Little Miss definitely got into the trick or treating too. She refused to skip any houses and was all business! Aunt Sue sent the kids some fun goodies (which reminds me, I never called to thank her..yikes!) We made this paper chain and decorated with stickers. The kids had started to decorate the handrail on the stairs with the stickers and I thought a paper chain to hang from the stairs would be a good compromise. 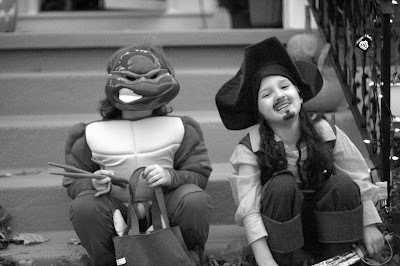 E and his Ninja turtle cousin who joined us for the neighborhood trick or treating. Mem and Pep with 4 of their 5 grandchildren. Handy Manny was sleeping in the car...must have been a tough day of repairs. Per tradition, we visited both gran-memeres for trick or treats; they are always thrilled to see us! I think they would be very sad if we didn't visit. Treats, treats, and more treats...how long does the sugar from all this junk actually stay in your body anyway? I'm feeling like my kids have been on a sugar high since then...is that possible? Have a sweet day all! Hope to "see" you soon.